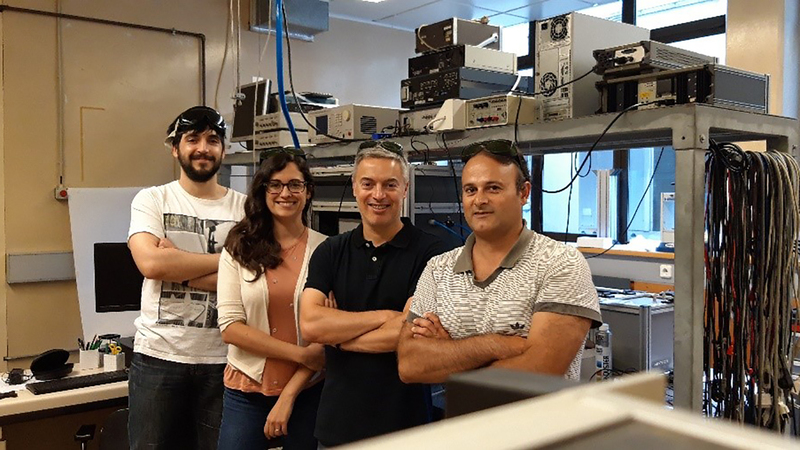 The work of Diana Guimarães and Miguel Ferreira, researchers of INESC TEC’s Centre for Applied Photonics (CAP), was distinguished by the Portuguese Society of Physics at the 21st National Conference on Physics (Física2018), which took place between 29 August and 1 September of 2018 at the University of Beira Interior, Covilhã. The distinction was awarded to the poster work entitled “Comparação de um aparelho portátil de XRF com um protótipo de LIBS para medição de Fe em amostras litiníferas” (in English "Comparison of a portable XRF device with a prototype of LIBS for measuring Fe in lithian samples" (authors: D. Guimarães, M. Ferreira, R. Martins, P. Jorge and A. Lima). This work was developed by the researchers in the scope of a new research area of CAP, the LIBS Spectroscopy (Laser Induced Breakdown Spectroscopy), introduced in the VAMOS project in collaboration with the Centre for Robotics and Autonomous Systems (CRAS). This technique allows the identification and the measurement of elements in materials in a microinvasive way. The focus of this work is based on the current need to assess the mineral natural resources, namely lithium, a strategic resource for the electric mobility. This work was also carried out with the collaboration of the Department of Geology of the Faculty of Sciences of the University of Porto. Currently, the team of researchers work under the "Coral-Sustainable Ocean Exploitation: Tools and Sensors” project; FlapSys, MetBots and VAMOS.